An overview of my current portfolio strategy. Changes to my strategy in 2017. 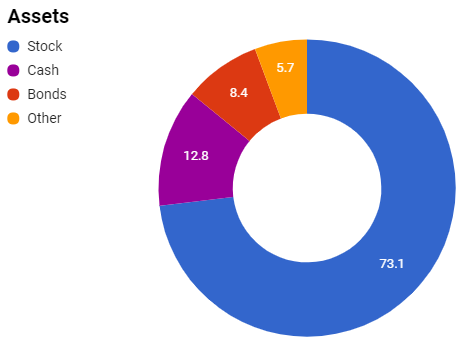 Current holdings, and allocation plans for 2018. This article explains my investment strategy going into 2018, as well as changes to my strategy over the past year. I mainly discuss equities, which I’m still bullish on given the economy’s strong fundamentals and the earnings catalyst of U.S. tax cuts. LPL Financial has cited these factors in their recent S&P 500 earnings forecasts, believing the index "would be fairly valued in the range of 2,850–2,900 by year-end 2018." Due to a widened valuation gap between growth and value stocks, however, I’m increasingly valuation-conscious in stock selection. I’m also holding additional cash to allow for dip-buying, as indicators like the S&P 500 Weekly Relative Strength Index, Bank of America Global Fund Manager Survey, and Conference Board Consumer Confidence Survey suggest exceptionally bullish sentiment today. A detailed look at my 2017 performance will be posted separately within the next few days; here I highlight those results only as they relate to my allocation plan. The main goal of my portfolio is capital appreciation, hence the majority allocation to equities shown below. I try to manage equity risk with careful stock selection, mutual funds, and a diverse group of non-equity holdings. My equity position is down 9% from the prior year, due partly to valuation concerns and partly to substantial cryptocurrency profits realized toward the end of 2017 (yes, the irony of mentioning valuation concerns and cryptos in the same sentence is hard to ignore, but my crypto holdings have always been minimal in cost basis terms). Bonds are up 4%, and cash is likewise up 4%. The Other category comprises 45% cryptos, 43% gold and silver, 11% alternative assets held in mutual funds, and 1% protective puts. I currently only hedge my Twitter shares. Although my crypto position increased from 1.0% to 2.7% (and, I’ll emphasize, with zero purchases in 2017 aside from crypto-to-crypto conversions), I locked in several times that gain by selling cryptos heavily throughout the year, especially in December. Details of those trades can be found by following the Twitter link in my profile. The stocks I designate as speculative are 3D Systems, Stratasys, and Twitter. At the end of 2017, 46% of the value of my single stocks was held in IRAs. My top 7 IRA holdings (CVS, Roche, Priceline, Baidu, GE, WPP, SCANA) comprised 51% of that segment. As explained in my article “Bed Bath & Beyond the Star Rating”, holding Bed Bath & Beyond from May to July taught me to be more conscious of business quality in my stock selection. I was already using Morningstar’s Fair Value Uncertainty and Economic Moat ratings as indicators of quality, but I place far more emphasis on the Moat rating now. 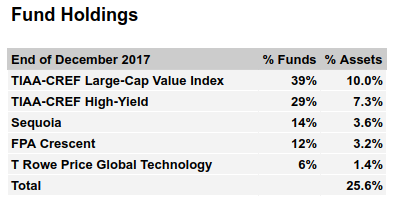 Out of my 11 year-end holdings added in the second half of 2017, 8 have Wide Moat ratings, and the other 3 have Narrow Moat ratings. As time goes on, I’m increasingly aware of my shortcomings as an individual investor (in particular, that I lack the time and resources to understand my holdings as thoroughly as professional investors do), and increasingly skeptical of my ability to profit from an original investment idea. My stock picks have for years been heavily influenced by those of Berkshire Hathaway and several mutual funds I trust. In 2017 I began following the picks of Morningstar StockInvestor as well. I decided to formalize this practice with a new allocation rule to invest at least 75% of the value of my single stocks in names held by one or more of the aforementioned entities. There’s still a question of position size to be addressed (a 0.5% holding in a mutual fund, for example, isn’t a big vote of confidence), as well as whether the professional picker has recently initiated or reduced a position, but I hope to eventually find a way to incorporate those factors into the rule. Another way I’m acknowledging my shortcomings is by investing in certain mutual funds to help meet allocation goals which are difficult to achieve on my own. To that end, I initiated holdings in FPA Crescent (FPACX) and T Rowe Price Global Technology (PRGTX) in 2017. Two TIAA funds in my employer plan remain my top fund holdings. I chose FPA Crescent because I believe allocation funds best represent my own investing style today, and Crescent’s flexible cash position aligns with my belief that cash should be built up or deployed depending on market conditions. The fund has a good track record of market timing, and will help reduce the role of my own market timing in my allocation decisions. Over the years I’ve had a tendency to speculate on technology trends that I have little insight into, which has at times led to big losses. T Rowe Price has successfully traded around these trends for many years, and my hope is that holding the Global Technology Fund will lead me to take less stockpicking risk in the tech sector. 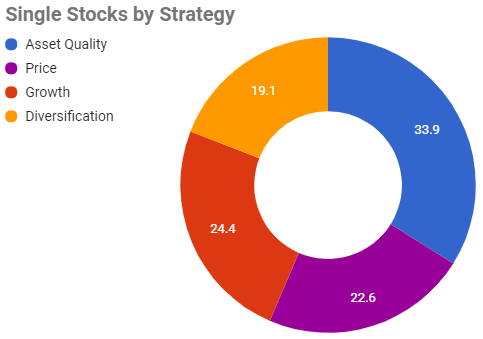 Still, I’ve achieved S&P-outperforming single stock performance ever since cutting my overweight energy position in early 2016 (and with a lower expense ratio than that of my fund holdings), so I plan to keep single stocks at the core of my equity strategy. Precious metals have been my primary hedge against the risk of rapid inflation for most of my investing career, and thus far have proven to be a costly one. I diversified my hedging plan in April with my first TIPS purchase, during the Treasury’s 5-Year auction. TIPS were just over 1% of my assets at year end. I’ve been a skeptic of Treasury bonds ever since the 2011 debt ceiling crisis, but these days my skepticism is mostly contained to the 30-year issues. As unsustainable as the historic national debt level may be, the U.S. government has muddled through it for the better part of a decade, and can probably muddle for at least another decade. For now, the majority of my bond holdings are corporates via TIAA-CREF High Yield (TIHYX) and FPA Crescent. I have seven explicit allocation targets for my portfolio, shown in the chart below. Most of these I originally posted in my April article. One rule I leave out of the chart is that I limit the maximum cost basis of my speculative assets to where it was at the end of 2016, allowing new purchases only in proportion to sales elsewhere. This is to avoid rebalancing upward to a market value target if the prices of these assets happen to spiral downward indefinitely, as speculative assets are wont to do. My April article described a target called Low/Medium Uncertainty (based on Morningstar’s Uncertainty ratings), which I deemed flawed after my experience with Bed Bath & Beyond, among other factors. I’ve replaced it with one called Value Stocks, using Morningstar’s Style Box categories (Growth, Value, and Blend). The intent is the same: formalize a margin-of-safety concept, and apply it to my stock allocations. Like the old target, this one varies based on a formula, and uses LPL Financial’s recession odds estimates as one of its inputs. Another input is the Style Box composition of the Vanguard Value ETF (VTV), which limits how far the formula can go in curtailing my growth investment aspirations. 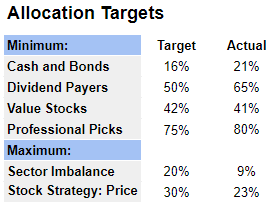 The Professional Picks target is also new, as mentioned earlier. To illustrate the variability of the Value Stocks target, my hurdle was raised near the end of the year when Morningstar recategorized Berkshire Hathaway and GM as Blend instead of Value. This initially set my Actual to 38%, and I’m still playing catch-up. I have other, softer targets, like the 55% long-term holdings I mentioned in April. My long-term holdings finished the year at exactly this level. I don’t anticipate increasing it anytime soon, due to my large cash position and my tendency toward shorter-term trades in the Price strategy. Finally, I’ve been underweight technology stocks relative to the S&P for a long time now. I plan to increase my tech exposure at some point, but only if valuations in this pricey sector become more attractive. In the spirit of dramatic closing remarks, it feels a bit like 1999. Disclosure: I am/we are long ALL ASSETS, UNLESS OTHERWISE STATED. I wrote this article myself, and it expresses my own opinions. I am not receiving compensation for it. I have no business relationship with any company whose stock is mentioned in this article.